Matthew Peterson: Well, let me ask you a bonus question. It’s obvious that you have a good grasp of how to write an award winning novel. What are some of your secrets of telling a good story? Kate DiCamillo: What are some of my secrets? My secrets are working. So showing up and making small manageable goals for myself. So for me that’s two pages a day. And the other thing is paying attention to everything . . . to people when they talk and the world and to all of its mysteries. And then the biggest thing I guess is kind of like getting out of my own way and letting the story tell me rather than me trying to dictate the story. So those things, I think. Matthew Peterson: Good. Well, thank you, Kate. Kate DiCamillo: Well, thank you, it was awfully fun and easy! Matthew Peterson: I need to make sure I can say your last name correctly. Kate DiCamillo: [laughs] Okay. I’ll listen. Matthew Peterson: Di . . . DiC . . . How did you say it? Matthew Peterson: DiCamillo, okay, good. Yeah . . .
Kate DiCamillo: Just think mellow, even though I’m really neurotic. Matthew Peterson: I can do that. I had Tony DiTerlizzi . . .
Matthew Peterson: . . . yeah, the other day. Kate DiCamillo: Actually DiCamillo’s a lot easier than that, you’ve got to admit. Kate DiCamillo: It’s all the jokes of Italians. We just do whatever we want with our pronunciation. Kate DiCamillo: He’s a really nice guy, Tony is. Matthew Peterson: Yeah, he is, he is. And I did see that you were from Italian decent. I saw that on your . . .
Kate DiCamillo: Yes, on my dad’s side. Matthew Peterson: On your dad’s side, yeah, okay. So, DiCamillo. Alright guys, I’m going to stop here really quick, now after all of that with Kate, I’m going to play kind of a blooper here. The blooper of when I ended the interview, so here it is. 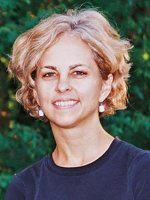 Kate DiCamillo: You’re doing it! Try one more time, I’m not going to interrupt again. Matthew Peterson: DiCamillo, okay. I’ll edit that out. Matthew Peterson: I’ll have to edit this slightly to make sure it fits in the . . .
Kate DiCamillo: I think that you should leave it in there because everybody always, you know, it’s a name that confounds everybody. It’s pretty nice. Matthew Peterson: Yeah, you know, I know a lot of people do have a hard time, and it is your baby and you are signing it away. I’ve interviewed authors like Ursula K. LeGuin who tell me that the film companies just tend to slaughter their books. Kate DiCamillo: I feel like I’ve been lucky two times, is basically how I feel, and you know once you say you’re either going to sell the movie rights or you’re not and once you do... once you say, “Yes, I’m going to do it.” You don’t have any control really. You’re kept in the loop. I worked on Winn Dixie and worked on the screen play, but still, it’s their project then and not yours, and so you can only step back and hope that wonderful things happen, and I feel like wonderful things have happened twice. Matthew Peterson: Yeah. It was wonderful. So you did have a little influence. I mean, you did help a little bit with the screenplay, then? Kate DiCamillo: With Winn Dixie. I did. Matthew Peterson: With Winn Dixie, okay. Kate DiCamillo: On Despereaux, it was more just kind of like this marvelous world that was being constructed without me having to do any work. Kate DiCamillo: It was nice. Matthew Peterson: And New Line Cinema bought the option for The Miraculous Journey of Edward Tulane. And that’s in pre-production right now? Matthew Peterson: How’s that going? Does it look like that’s going to be a go? Kate DiCamillo: Well, what I know is that there’s a beautiful script, is what I’ve heard. And then there is a producer and there’s studio. So those things all make it look, you know, very much like it will happen. So . . .
Matthew Peterson: It’s always one of those things that you’re not sure if it’s going to happen. But you’ve been pretty fortunate. I mean, you have several books and two of them already have become movies. Kate DiCamillo: Right, you know, and you learn all of that as you progress. It’s like a really, really unbelievable thing when something gets optioned and then you learn that option is just the first, you know, everything all along the way. It is miraculous for something to get made. Kate DiCamillo: So I have been incredibly lucky. Matthew Peterson: Well, I’m not as familiar with The Miraculous Journey of Edward Tulane, but tell us just a little bit about that book. Kate DiCamillo: There’s a rabbit and he’s a toy rabbit; he’s a rabbit doll, although he would find that description mildly offensive. And he’s very vain and pleased with himself and he’s beloved by the person who owns him, Abilene, a little girl named Abilene. But then they become separated, and in the course of Edward getting lost, he learns how to love. Matthew Peterson: [Regarding the artist] I mean you can tell that he’s read the book and he knows what he’s talking about. Kate DiCamillo: Oh, it’s a she. Matthew Peterson: Oh, she, I’m sorry. She. Kate DiCamillo: Yeah, no, that’s okay, she would want you to know. She’s actually in Thailand. Kate DiCamillo: It’s so weird to think that, you know, I’m here in Minnesota. I write the story and this is a story with snow in it and that somebody in Thailand can capture it so perfectly. Matthew Peterson: [laughs] I know. Have you met her? Matthew Peterson: You haven’t met her; you just know her name. Kate DiCamillo: Yeah, I just know her name, that’s it. Exactly, that’s it. Matthew Peterson: I must admit I had envisioned just a slightly different ending. Kate DiCamillo: Oh, don’t tell me what it was. Matthew Peterson: I write too, and that’s my curse, so I’m always coming up with like multiple endings and always trying to predict things. Kate DiCamillo: What? Is it a happier ending? Matthew Peterson: Oh, no, yeah, it’s happy, yeah. I’m a happy ending type of a guy. Kate DiCamillo: Well, I tend towards the happy ending myself, but there’s always a minor key at work too. Kate DiCamillo: So Scarlet O’Hara and Ret Butler would get together. Kate DiCamillo: [laughs] That’s good, that’s good. We need the optimism. We need the hope. Matthew Peterson: [Regarding Something Wicked This Way Comes] That movie scared me to death as a kid. Kate DiCamillo: I never saw it. Matthew Peterson: Oh you didn’t? Matthew Peterson: Oh, just imagine a little kid watching Something Wicked This Way Comes. It’s really kind of a scary thing.